Organizers of Ladies in Sport Conference have said Benny Bonsu, International sports journalist and founder of GirlsinSports UK will lead a cast of top names in the football and corporate world to the 2017 edition of the Ladies in Sports conference. Joining Bonsu will be Ita Bassey, Senior Brand Manager, Star Lager Beer; Felix Awogu, General Manager, Supersport West Africa and Onome Ebi, footballer, Super Falcons. 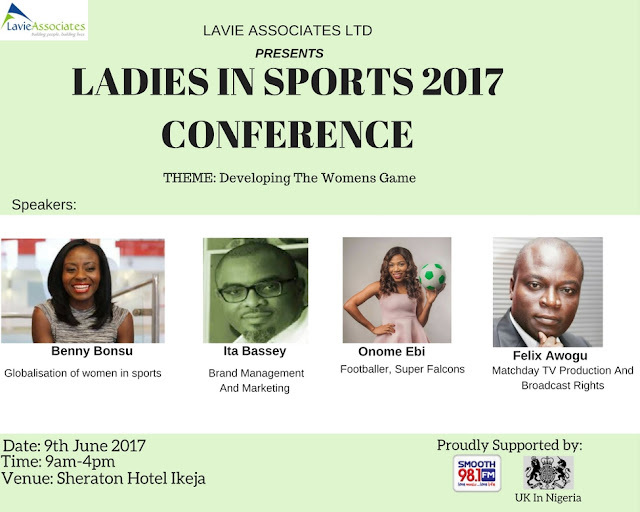 The 2017 edition of the Ladies in Sports conference comes up on the 9th of June, 2017 at the Sheraton Hotel Ikeja. The theme is "Developing the Women's Game" and is centred around women's football, both at club and national level. Open to all club administrators, academies, football managers, football administrators, corporate bodies and the media. The conference seeks to improve and promote women in sports and women's sport through lectures, grants and networking.